Website Development Payment Obligations: A down payment is required to begin development of a website. Initial down payment amounts no less than 50% of the upfront design fee unless an alternative contract or proposal specifies a different amount. The outstanding balance of website is due after the design, navigation, and pages have been approved and built. Final payment is due regardless of whether all content for the pages has been sent by the client. This provision shall be in place to encourage the client to get content submitted promptly so that their site can go live. It also ensures that Imagine Web Solution gets paid for performing their duty under the proposal, despite tardy content from the client. After payment, Imagine Web Solution will still post outstanding content AT NO CHARGE for 3 months. In the event an "under construction" page is posted due to missing content, Imagine Web Solution will post ONE copy of any text/pictures on existing pages only, for up to 3 months after publishing date. After the three months have expired, content posted to the site will be billable at our current regular hourly rate. In the event that design and navigation changes are requested after they have been specifically approved by the client, these changes will be billable at our current regular hourly rate. Website Development Cancellation: The down payment is non-refundable, after concluding the contract, if the site design and development work such as creating a design concept etc. has already begun. Imagine Web Solution may use its sole discretion whether or not to offer a partial refund depending upon the circumstances. Stock Photography Payment Obligations: Stock photography includes most photos and/or images not provided by the client. Stock photography purchased on behalf of the client for use in website development is billable at a minimum of $5 per picture. This amount is separate from the amount quoted for website design and development. Some pictures are more expensive than $5, in which case Imagine Web Solution shall solicit client approval and communicate the price before purchasing. Domain name registration: This cost shall recur annually. Domain name registration gives you exclusive rights to a certain name, such as www.mytravel.com, so that you can use it for your web-based purposes. You are NOT required to register a domain through us, but we strongly prefer that you do. Many services are not honest in the way they sell names and we spend a lot of time helping people re-secure rights to the name, they thought they had already purchased. If you have registered your own name, make sure you have yourself as the Registrant and Administrative Contact with a current, easily accessible email address. This will help to ensure that your domain can be renewed or transferred should the need arise. Domain name registration fees are not refundable. Hosting: This cost also shall recur annually. Hosting places where the domain name on a particular server connected to the web, which allows you to post a website for viewing through a browser. You are NOT required to host through us, but we strongly prefer that you do. Hosting comes with domain-based emails, bandwidth, storage space, database and security tools, and other features. Projects that involve custom programming must be hosted with Imagine Web Solution to ensure the programs that we write will work. If you want to host your site on another server this must be disclosed before we begin programming. Hosting Renewal Payment Obligations: Your hosting account will be automatically renewed under the same time and fee structure unless you give written notice to Imagine Web Solution fifteen (15) days before the renewal date that you do not wish to renew the account. Hosting Cancellation Payment Obligations: You may cancel at any time. If you cancel before the first 30 days from the opening of your account, please refer to the details under "Limited 30-day Money Back Guarantee." If you cancel after the first 30 days, you will be obligated to pay all fees and charges accrued prior to the effective date of the cancellation. Imagine Web Solution will refund the prepaid fees for basic hosting for the full months remaining after the effective date of the cancellation, less any prior fees and charges, and an early cancellation fee of $15. Accounts that are terminated by Imagine Web Solution for abuse or violations of internet standards or these terms and conditions will not receive any refund. All cancellations must be received in writing according to the deadlines indicated--regular mail and e-mail are acceptable. Phone requests will not be acceptable for any cancellation. Refunds will be issued back to you within 10 business days from your cancellation date. Hosting Transfer Payment Obligations: If you wish to transfer your hosting to another provider Imagine Web Solution can upon request, download your site onto a CD and mail it to you upon payment of $50 per copy for providing this service. FTP access to your site shall not be available for transfer purposes. Limited 30-day Money Back Guarantee on Hosting: If you are not completely satisfied with our services within the first 30 days from the opening of the account, Imagine Web Solution shall refund your hosting fee, excluding setup fees and time accrued from setup date. If payment was made through credit card, refunds will be issued to the original credit card provided at the time of purchase. If your account has been canceled by us due to a breach of the terms and conditions on your part, you will not be eligible for a refund. Domain name registration is non-refundable. Sites NOT Hosted by Imagine Web Solution: Should the client decide to host their site on another server, Imagine Web Solution cannot guarantee the all elements of the site will work. Imagine Web Solution will make a reasonable effort to research the problem on the foreign platform to let the client know what we think the problem is. However, we cannot take responsibility for problems caused by or on another hosting server, including but not limited to email, FTP, SSL, database, server software, and site security issues. If Imagine Web Solution believes it will take a significant amount of time to fix the problem, we will advise the client before proceeding. In most cases, fixing problems on a foreign hosting server is billable. Website Maintenance: There are no required maintenance fees other than domain registration and hosting. Most people do some work on their site every year, for which we offer several plans. We can make certain parts of the site updatable by you by implementing a custom Content Management System or installing a blog. For work we do on the site after going live, we charge on an hourly basis. If you expect that maintenance will be a regular occurrence, you can buy a prepaid maintenance contract that affords a discounted hourly rate. If the need is felt, we can customize a maintenance plan for your particular needs, but no plan is required. Website Maintenance Payment Obligations: Depending on the nature of the website changes, prepayment may be required. Should the client be invoiced after the changes are completed, the invoice is due upon receipt. If payment is not received within 30 days, the maintenance changes may be taken down until payment is received. After 60 days, there may also be a $20 reposting fee added to the outstanding maintenance invoice balance. Homepage Design: Once the site design is approved by the client, usually via email consent, the design is considered ready for implementation. Should the client wish to make changes to a design they have approved, those changes are billable at our standard hourly rate. Navigation: Once site outline/map is approved by the client, usually via email consent, the site navigation is considered ready for implementation. Combined with the approved graphic design, this becomes the site structure. Once we build this structure per client approval, any subsequent changes are billable at our standard hourly rate. Content: Provision of content is customer's responsibility unless specifically negotiated in prior, as part of the project proposal. Copy development: Should the client wish Imagine Web Solution to develop content for the site, website copy is billable at our regular hourly rate. Development of copy is accomplished via Imagine Web Solution Web Development interviewing the client about the topic areas to be addressed on their web pages. 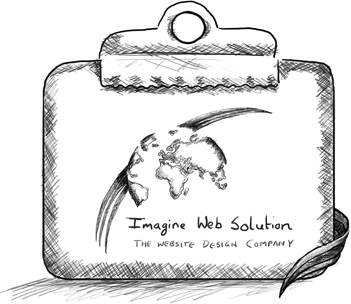 Imagine Web Solution then composes appropriate copy, submits to the client for review, edit, and approval. An approved copy is then posted to the web pages. Graphical content: Images outside of the website design must be provided in the digital form or in a form that can be easily scanned unless otherwise provided for in customer contract. Subsequent revisions will be billable at our regular hourly rate. Database Implementation: Entry of data for database applications is considered client responsibility. Entry of data by Imagine Web Solution is billable unless otherwise provided for in customer contract. Email: We offer free domain-based email accounts to our clients as part of any hosting contract. If the site is not hosted by Imagine Web Solution, we take no responsibility for setting up and troubleshooting email problems. Training: For websites with administrative control panels or content management systems, two (2) one-hour training sessions will be provided. Technical Support: Imagine web solution team offers local and long-distance phone support to our clients. We do not normally bill for technical support depending on the source of the problem, its severity, and our time invested. If Imagine Web Solution is not the source of the problem, technical support may be billable. Imagine Web solution believes that customer service is our integral part. All of our projects include a one-time complimentary training session in order for our clients to better make use of their new web technology. Additional training hours can be purchased at our standard hourly rate or applied against your existing maintenance contract. For domains not originally registered with Imagine Web Solution, there will be a $15 fee to either transfer to the domain into our registration platform, or to transfer-out to another registrar. If your domain is not registered with Imagine Web Solution, DNS management and troubleshooting tasks are billable at our hourly rate. Should client contract with Imagine Web Solution to write custom code for a website application, this code is not transferable to a new developer or host. The custom written source code is considered the property of Imagine Web Solution Web Development and cannot be shared with other developers. Clients are granted a license to use custom software code only on Imagine Web Solution servers. Imagine Web Solution Web Development retains ownership of the code. In some cases, Imagine Web Solution shall install software for the client use that has been built by a third party. Examples include Wordpress blog software, FCK editor software, shopping carts, photo galleries, etc. In these instances, clients will be subject to the terms and conditions of the third party who owns the software and may use the software as a licensee only. No ownership rights of any kind are transferred to the client. Access to or transfer of proprietary source code could result in a security risk to Imagine Web Solution and its clients who are running similar pieces of code. In order to provide custom software development services, clients shall give us access to private and/or sensitive information, trade secrets, proprietary pricing, and business methods. If clients believed that we may be sharing this information with outside developers, they could lose faith that we are protecting their proprietary information. Therefore, neither access nor transfer of any code built for any purpose that is unique and not commonly and publicly available can be granted. Should the client want us to build software to run on another server, it must be disclosed upfront and specifically contracted for. Imagine Web Solution Web Development maintains and troubleshoots the websites we develop for our clients, as well as any domain-based email accounts of those websites. We do NOT assume responsibility for upkeep or provide non-billable troubleshooting on our clients' ISPs (Internet Service Providers), ISP-based email accounts ([email protected], [email protected], etc), your home or office internet connections, or any other non-domain-based issues outside Imagine Web Solution Web Development's realm of service. Provision of non-domain-based troubleshooting services will be billable at our normal hourly rate.